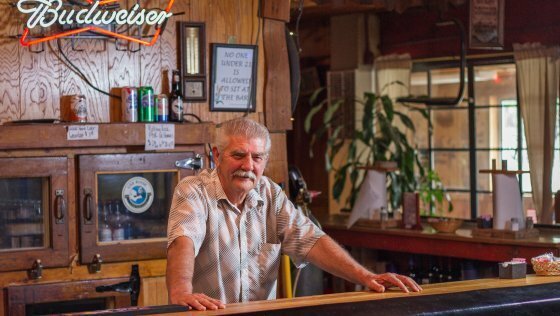 In one of those delightful moments of serendipity that punctuate our otherwise mundane lives, I first heard about Ben’s Crow Inn, an East Boise fixture for more than 70 years, from some Washington state tourists. My husband Ed and I were standing in line at an Idaho City gas station several summers ago, escaping the valley heat for some cool mountain air, when Ed struck up a conversation with the couple in front of us. “What brings you to Idaho?” he asked. “We actually came for the clams,” the man unexpectedly replied. He then told us about Ben’s Crow Inn. As it turned out, his culinary Mecca was a mere five minutes from our house, conveniently situated along the Greenbelt where we biked each weekend. On our next summer weekend bike ride, we made a point to stop at Ben’s Crow Inn, and like so many others, we were hooked. I can’t count how many buckets of steamed clams and pitchers of beer Ed and I have shared on the restaurant’s spacious patio over the years, but for me, as for many Boiseans, Ben’s Crow Inn became synonymous with lazy summer late afternoons. After a Highland Valley hike, we would park our bikes and choose a worn wooden picnic table, screened to keep out the flies. The old school metal construction toys delighted the younger kids while we waited for our clam bucket, with orders of equally popular finger steaks for the seafood-wary kids. A “half fries, half salad” side order was always more than enough for two on both accounts. They say that all good things must come to an end. Sadly, in the case of Ben’s Crow Inn, that’s true. Owners Ben and Connie Hamilton, who have owned the restaurant for many years, have decided to retire, and according to the Idaho Statesman, they have sold the land to a single family home developer. The property transition has not been as smooth as the Hamiltons might have hoped. When Ed and I tried to head out for a Greenbelt hike after an April clam bucket lunch at Ben’s Crow Inn, we found our way blocked by a chain link fence, erected by the owners to protest negative comments on the proposed land sale and development (the fence quickly came down). Boise City Planning and Zoning failed to support the residential housing plan in April, and as of this writing, that decision is under appeal. Meanwhile, the inexorable development of East Boise marches forward along Warm Springs Road. While I don’t know how the Hamiltons’ well-deserved quest for retirement will end, I do know this: I will miss Ben’s Crow Inn. As one Facebook reviewer wrote, “The food is always good, and the beer is always cold.” For some, myself included, that might well be a definition of heaven on earth.